Perhaps no species more captures the attention of the casual bird observer than this species! It is surely the species most asked about. Pileateds are present year around. However, they are considerably harder to find during the nesting season when they are quiet and secretive, and generally restricted to the woodland habitats along the Red and Turtle Rivers. To find them then, walk in the woodlands in early morning, listen for their calls, and watch for them in flight. At other times of the year, they range rather freely through the trees of cities and small towns, and can even be seen "shelterbelt-hopping" in open country. Pileateds like to dig extensively in trees that have considerable rot in the main trunks and limbs. They make long rectangular holes. Watch for piles of fresh chips at the base of a tree. 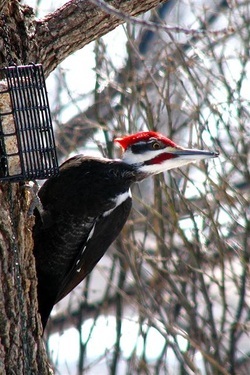 Although Pileateds are around every year, a definite nesting record for this species in the Grand Cities area was not obtained until the Spring of 2001.